Inflation is described as continuously rising prices, or the continuous fall in value of the money viz. Dollar or Rupee. The inflation rates are based upon the consumer price index (CPI). The Consumer Price Index is a measure of the average price which consumers spend on a market-based “basket” of goods and services. Inflation based upon the consumer price index (CPI) is the main inflation indicator in most countries. The CPI inflation rates in the table are presented both on a monthly basis, compared to the month before, as well as on a yearly basis, compared to the same month last year. The data required to arrive at the CPI is collected by the authorised designated agencies through a scientific sampling of prices on about 80,000 items (good and services). They gather, record and update the data monthly, which serves to track and measure price changes in the Consumer Price Index (CPI). Does the CPI reflect spending trends with price change? The Bureau of Labor Statistics (BLS) in USA reports that the all urban consumer group represents about 87 percent of the total U.S. population. What goods and services are included in the CPI ? Apparel: cloths like pants, shirts, sweaters, etc. Recreation: TV, pets, movies, pets, etc. urban areas for December 2013 are 10.49% and 9.11% respectively. Inflation rates (final) for rural and urban areas for November 2013 are 11.66% and 10.53% respectively. The average rate of inflation in India was 9.87% % in the year ending December 2013. 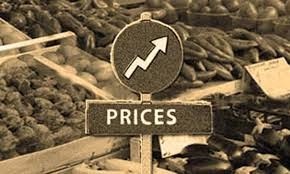 Inflation or price rise is a constantly changing phenomenon and the variables contributing in the Consumer Price Index also change according the socio-economic profile of the populace comprising of the particular territory at a given time and the political situation and other factors.